Keep up-to-date on everything happening with WS YOU 177 by checking this webpage. Follow us on Twitter. For regular updates, you can also sign up for the Legacy Project e-newsletter. 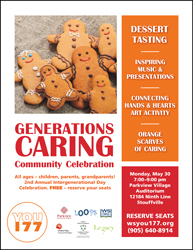 Generations Caring Community Celebration – a big success to celebrate Intergenerational Day, 2016 in Whitchurch-Stouffville. The event took place at Parkview Village Auditorium, and we had a full house with ages 2 to 92! The event featured a beautiful Dessert Tasting buffet, prepared with the help of Purple Onion Cuisine and other local businesses including COBS Bread Aurora Gateway and Village Grocer. We also had inspiring intergenerational music and presentations. And we honoured local nominees with WS YOU 177 Orange Scarves of Caring. WHEREAS every year on June 1st communities across Canada join together to recognize Intergenerational Day as a day to celebrate the vital connections between generations. Whitchurch-Stouffville is a 7-Generation Community that supports, connects, and values all generations. We recognize our personal responsibility to at least seven generations in our families and community – our own; parents, grandparents, great-grandparents; and children, grandchildren, great-grandchildren. Young and old come together as part of everyday life not only in support of each other, but to work together to build a thriving community for all now and into the future. Intergenerational Day is an official opportunity to celebrate our 7-Generation Community, and a reminder to bridge generation gaps and stereotypes to build relationships across generations in small ways every day. All ages and abilities have a valuable and unique role in Whitchurch-Stouffville. 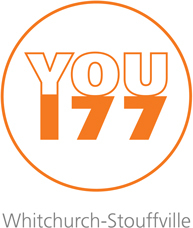 WS YOU 177 is a community-wide initiative bringing together many local groups and organizations in intergenerational programs and events to better the lives of all ages. The goal is a community that's a safe, healthy, and fulfilling place to grow up, have a career, raise a family, grow older and stay vitally connected to family and community. 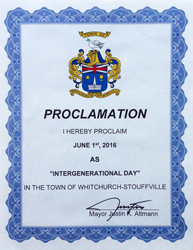 THEREFORE, I, Mayor Justin Altmann, on behalf of Whitchurch-Stouffville Town Council, do hereby proclaim June 1, 2016 as "Intergenerational Day" in the Town of Whitchurch-Stouffville. Dr. Helena Jaczek, MPP for Oak Ridges-Markham, announced a $35,000 Age-Friendly Community Planning grant for Whitchurch-Stouffville from the Province of Ontario. The WS YOU 177 collaborative of local organizations will work with the community on an Age-Friendly analysis. The Age-Friendly guidelines were developed by the World Health Organization (WHO) through a process that involved groups in 33 cities around the world. We'll add the "plus" by putting those guidelines into a 7-Generation context as part of WS YOU 177. A 7-Generation Community is one in which all ages are supported, connected, and valued. WHO developed Age-Friendly community planning guidelines across eight areas: public buildings and outdoor spaces; transportation; housing; social participation; respect and social inclusion; civic participation and employment; communication and information; community support and health services. We'll also consider UNICEF's Child-Friendly community guidelines, which emphasize the rights of children and youth to: influence decisions about their city; express their opinion on the city they want; participate in family, community and social life; receive basic services such as health care and education; have green spaces and an unpolluted environment; participate in cultural and social events; be an equal citizen of their city with access to every service, regardless of ethnic origin, religion, income, gender or disability. 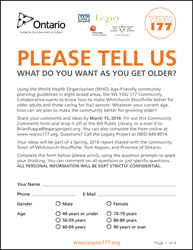 WS YOU 177 is leading local focus groups, discussions, and events around all aspects of aging in our community. In particular, we want to know what seniors need in terms of services, structures, and policies. Our growing older population also represents a tremendous source of social capital – wisdom, skills, and experience. Our challenge is to look at ways to strategically engage this social capital to meet community needs and build a stronger community for all ages. We want to hear from you! Fill out the Community Comments Form to make sure your comments and ideas are included. We'll complete a report for the community, WS Town Council, York Region, and the Province of Ontario for Fall, 2016. PresentPerfect is a new documentary by filmmaker Evan Briggs, due to be released Summer, 2016. Susan Bosak, head of the Legacy Project and part of WS YOU 177, has been involved in its development. Enjoy this 4-minute advance preview of a film that explores the heart of what 7-Generation Community can be. Read the recent Age-Friendly article in the Stouffville Sun-Tribune. Generations Growing in WS community garden. Let's get growing, Whitchurch-Stouffville! Join us at Sunnyridge Park for an intergenerational community gardening program. Generations Growing is all about growing great food and new relationships across generations in our community. 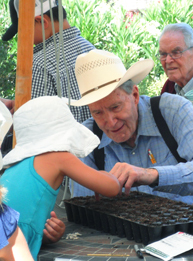 We welcome children, youth, adults, and elders – people who have never grown anything before and long-time gardeners. We have two raised beds (for those with back problems and other mobility issues) and one large ground-level plot. Last summer, we planted and enjoyed the harvest, and donated to the WS Food Bank. There was learning about gardening and food, cooking demos, and other great activities! We're doing it all again into the Fall. To register for WS YOU 177 Generations Growing, call (905) 640-8914 or e-mail us. Find out more about Generations Growing. Enjoy the universal language – Generations Making Music. 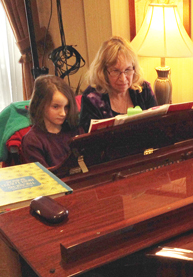 Once a month, we're getting young and old in Whitchurch-Stouffville together to make some music. Sing, play, or listen and clap along. We'll bring some ideas, but where the music goes depends on you. Your ideas and experiments – song suggestions, rhythmic ideas, even dance moves – feed back into the music that we make together as a group. Children, teens, parents and grandparents are welcome! The next event is Sunday, September 25, 2:00-3:30 pm at Stouffville Creek Retirement Residence, 40 Freel Lane. There's no cost to participate, and refreshments will be provided. Spread the word by sharing the information sheet. To register for WS YOU 177 Generations Making Music, call (905) 640-8914 or e-mail us. Find out more about Generations Making Music. 7-Gen Learning is about schools as places of possibility for all ages. We're planting some seeds for growing a new kind of learning in Whitchurch-Stouffville schools. Would you like to volunteer to help children with reading or math? 7-Gen Learning nurtures lifelong, deep learning as young and old learn from and with each other on a regular basis. While collaboration in schools between students is important, when students collaborate with older adults, the dialogue and learning goes much deeper. Many children get too much peer socialization; research shows they need 4-6 involved, caring adults to fully develop emotionally and socially. Yet we put children in age-segregated schools (even grades are based on age not ability), and build gated retirement communities. By intentionally creating an "elders-in-residence" role in schools, we start to transform the system, lives and communities. For more information about 7-Gen Learning in Whitchurch-Stouffville, call (905) 640-8914 or e-mail us. Find out more about 7-Gen Learning. Help create a vision for vibrant businesses and community wellbeing in Whitchurch-Stouffville. The Stouffville Chamber of Commerce, WS Public Library, ventureLAB, YMCA, and York University came together for an exciting WS YOU 177 forum on Monday, November 2, at York University. It was opened by the Lieutenant Governor, with an inspiring list of speakers and a diversity of community themes. Now we're working on a report filled with ideas and inspiration – it will be posted soon! 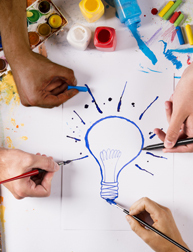 Find out more about Economic Innovation Forum. Building vital community can be supported through the design of places and spaces. The second WS YOU 177 Community Conversation took place May 21. It featured Gord Hume, recognized as one of Canada's leading voices on building vital communities. Hume has travelled the world to see firsthand what makes towns and cities work. With a background in business and media, he was a four-term councillor in London, ON. He chaired the Ontario Cultural Planning Partnership, and was a board member of Innovation Ontario Corporation. He's spoken at major conferences around the world, and was the keynote speaker at the UNESCO Congress on Creative Cities in South Korea. He's also the author of five books on building strong, creative communities. Places and Spaces is his latest – an insightful look at the public realm and how we design, use and sustain great communities. Check out this article in the Stouffville Sun-Tribune that ran before the event. Another article ran after the event, sharing some of the ideas Hume discussed. Hume's theme echoed this quote from his book Places and Spaces: "The scenarios are common: a government (at any level) proudly announces another round of cost-cutting 'to save hard-working families from being over-taxed and over-burdened.' They cut investments in culture, or architecture, or supporting parks and libraries, or providing great public spaces where people can meet and socialize. The result is the paradox of planning: they create exactly the opposite effect on their local economy, compared to what they want." "Our towns and cities today aspire to be successful, prosperous and deliver a great quality of life to local residents. 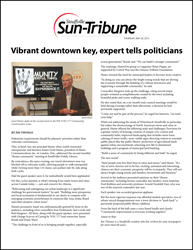 Local infrastructure is the foundation of the health, well-being and economic prosperity of communities," says Hume. 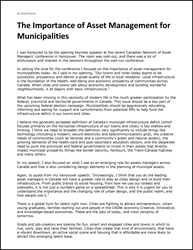 Read more details in this article by Hume from the Municipal Information Network. 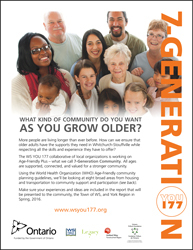 WS Town Council recently passed a resolution making us a 7-Generation Community, a community designed for all ages and stages of the lifecourse. What might the development of local places and spaces be like in a 7-Generation Community, especially as more people are living longer than ever before in history? Trans/multi-generational design features should be a part of every new house and subdivision, and certainly every new retirement community. Housing for frail seniors should draw not on an institutional model but on what real homes look and feel like. 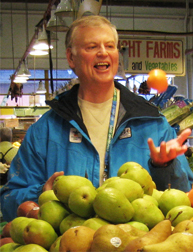 For example, Dr. Bill Thomas has pioneered the Green House model. To design for connection instead of isolation, seniors housing should allow elders to age in one place as physical/cognitive disability increases. They should always be directly and physically (we have long winters!) connected to an active community hub like a school (which gives direct interaction with children/youth). We need intentional community design that breaks down the barriers of age segregation to the benefit of the whole community. York Region faces a challenge in affordable housing. The ideal is for all generations to be woven into everyday, natural interaction. For example, every assisted living home could have affordable housing as part of it. This affordable housing could be for single-parent families or young people, for example. These families/young people would, for reduced rent, help the elders. But the long-term goal is creating a real sense of family. This type of congregate living would be a lifestyle choice in which both elders and the youth/families come into the arrangement knowing that the expectation is that they "care" for each other – whatever that looks like. This kind of model has been used in San Diego County, CA (the Global Mentor Community for YOU 177) with great success. 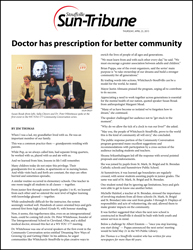 Doctor has prescription for better community. The first WS YOU 177 Community Conversation took place April 18. It featured Dr. Peter Whitehouse. Dr. Whitehouse founded The Intergenerational School in Cleveland, OH. It's become one of the top performing schools in Ohio and received the 2014 Eisner Prize. 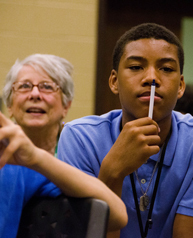 At The Intergenerational School, students are grouped by age clusters rather than grade, and elders (even those with cognitive or physical limitations) are woven into the fabric of the school day such that young and old learn from and with each other. The public charter school is connected by a walkway to a seniors housing complex. Research conducted on the school has shown that students have higher levels of academic achievement, as well as better social skills (e.g. empathy). Elders experience better health, less depression and social isolation, and feel a sense of meaning and purpose as they are part of the school community every day. Dr. Whitehouse started by showing an evocative 4-minute introductory video about The Intergenerational School. 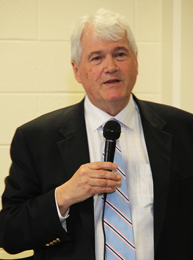 At the event, Dr. Whitehouse urged communities like Whitchurch-Stouffville to plan creative ways to enrich the lives of people of all ages and generations. "We must learn from and with each other every day," he said. "We must encourage a greater association between older adults and children." Read more in an article that appeared in the Stouffville Sun-Tribune. Conversations across generations can change lives and help build a stronger community for all. 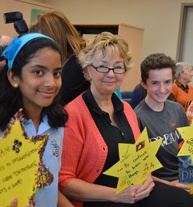 The WS YOU 177 Listen to a Life Contest is run in partnership with the WS Public Library and Stouffville Sun-Tribune. In addition to being eligible for the national Grand Prize, students in Whitchurch-Stouffville are eligible to win a special WS prize of a $250 gift card from a major retailer courtesy of Stouffville Creek. Find out more about the Listen to a Life Contest. 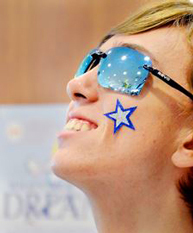 We're doing Dream author presentations at all local schools as part of One Town, One Book. When would your school like bestselling author Susan Bosak to visit? 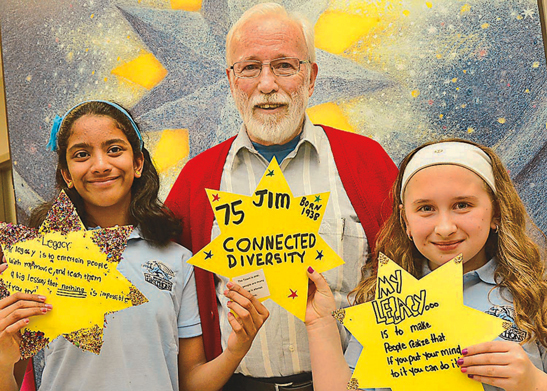 Students, parents, and grandparents are also creating Dream Stars, which will be shared between schools in Whitchurch-Stouffville so that we all get to know each other better. Susan Bosak has already visited Glad Park, Summitview, St. Brendan, Wendat Village, Ballantrae, and St. Brigid. For more information, contact the Whitchurch-Stouffville Public Library. Orange Scarves of Community Caring. Contribute an orange scarf, knit a stronger community. 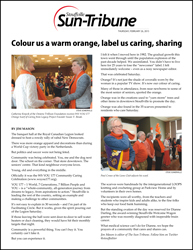 Orange is the new colour of caring in Whitchurch-Stouffville! We kicked off with a yarnstorming in downtown Stouffville – did you notice orange scarves in the trees? Then we had a big Community Caring Celebration! Now let's carry that spirit of caring forward. A scarfing is a surprise gift of a YOU 177 Orange Scarf of Caring to someone helping create a caring community OR to someone who might be able to use a little extra caring. 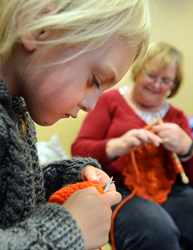 We're inviting young and old to knit or crochet Orange Scarves of Caring. Make scarves at home (you can drop off completed scarves at the WS Public Library) or participate in the intergenerational Loops group that meets Tuesdays, 4:00 to 5:30 pm at Parkview Village Cafe. Nominate someone you think deserves a beautiful, handmade YOU 177 Orange Scarf of Caring by e-mailing us the person's name, why you're nominating them, and their contact information. You can also call (905) 852-3777. It's all about caring, community, and fun. Find out more. 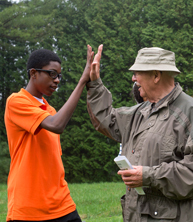 WS YOU 177: Young and old team up to change their community. 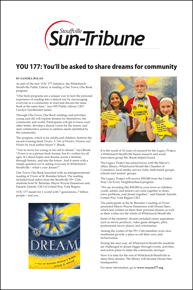 The community-wide WS YOU 177 initiative aims to harness youthful energy and the wisdom of age to set an example for others and make a difference. Check out Whitchurch-Stouffville's newest "intergenerational power couple." At 75, Diane Ward is as energetic as some people who are half her age. 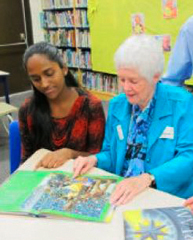 A life-long volunteer and seventh-generation Canadian, Ward has embarked on a volunteer project of a different kind with first-generation Canadian Shyana Srikanthalingam, 14. Notwithstanding differences in their ages, life experience and cultures, the two have become fast friends. Together, they’re trying to ignite interest in the community about how to make their rapidly growing and ethnically diverse town better. Read more from the article in The Toronto Star. We asked all ages in Whitchurch-Stouffville: Do You Care? A civic engagement event was done in partnership with the Stouffville Sun-Tribune and the WSP Library. 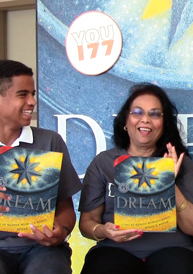 As part of WS YOU 177, the WSP Library is collecting the dreams of everyone in Whitchurch-Stouffville. 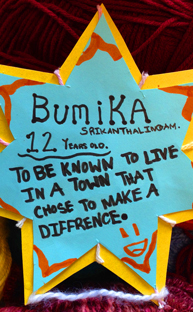 For 12-year-old resident Bumika, her dream is "to live in a town that chose to make a difference." The only way you can make a difference is to get involved. We discussed caring, leadership, and power. 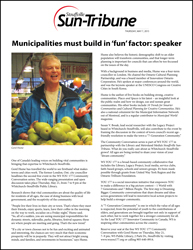 How can we make Whitchurch-Stouffville a more involved and engaged community? How can we bring all ages together not only in support of each other, but to build a stronger community for all now and into the future? WS YOU 177 will no longer have to dream about base-level funding. Oak Ridges-Markham MPP Helena Jaczek and Savi Singh, an Ontario Trillium Foundation volunteer, were at the grand opening of WS YOU 177 Dream Star Headquarters at the Whitchurch-Stouffville Public Library – and to offer congratulations to the community on receiving a three-year, $225,000 grant from OTF. "YOU 177 will foster more communication between generations of people, in such Whitchurch-Stouffville will become a stronger and better community," said Jaczek, Ontario's new Minister of Community and Social Services. Read more from the article in the Stouffville Sun-Tribune. 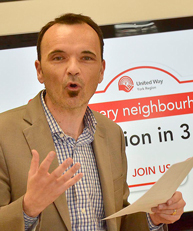 Daniele Zanotti is the irrepressible, innovative CEO of United Way York Region. As United Way's mission has evolved, it's going beyond immediate needs and focusing attention on the underlying, root causes of social issues. Strengthening bonds between neighbours through community projects is an important part of United Way's current focus. In this interview for WS YOU 177, Mr. Zanotti shares his insights into caring, community, dreams and legacies. United Way York Region announced a $30,000 Strength Investments grant to support this innovative new initiative for Whitchurch-Stouffville. With the message of "dreaming bigger and creating legacy," WS YOU 177 is a community-wide journey that connects young and old to collaborate and solve local issues. WS YOU 177 stands for Whitchurch-Stouffville in 1 World, with 7 Generations, 7 Billion People and YOU. Read more from United Way York Region. WS YOU 177 One Town, One Book launched at St. Brendan School with grade 4-8 students and elders from the Stouffville 55 Plus Club. 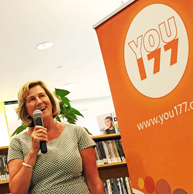 United Way York Region also announced kick-start funding for WS YOU 177. “One book programs are a unique way to turn the personal experience of reading into a shared one by encouraging everyone in a community to read and discuss the same book at the same time,” says WS Public Library CEO Carolyn Nordheimer James. Through One Town, One Book readings and activities, young and old will explore dreams for themselves, the community and world. Participants will get to know each other better, develop a shared vision for the future, and start collaborative actions to address needs identified by the community.